Been falling behind on the blog lately but things have been….busy. But two posts in two day? For real? I’m now a double dad, two sons. Being a dad is one of if not the most important aspect of my personality. They will always take priority and that is unfortunate for this blog and my drive to experiment as much as possible in brewing. Even though I have less time than I did before, I will continue my experimental hop series of beer because I have already bought the hops and it is one of things this blog does that I love love love. These are also some of my most popular posts. The other reason why I’ve been so busy is that I’ve started a professional brewery…more on that in a different post (probably). So, Jarrylo….honestly this was a hop I was fine skipping when it showed up on lists of experimental hops. I had a beer made with this hop from a friend of mine right when they came out and we both agreed that it was pretty underwhelming as far as a hop went. The more I thought about that beer (which turned out had a few different hops in it) and the goals of this blog and specifically this series of posts, I thought I would be remiss not to do it. I have to give it a chance to shine, by itself, in a simple light beer. Jarrylo is a high alpha acid hop (>15%!) so at minimum it would be a cheap hop to bitter beer with but in addition it has some pleasing characteristics. Here are the numbers…. The manufacturer’s description makes these sound like they belong on the “citrus” end of the spectrum…like a cascade or Amarillo, that’s great. Some of my favorite kinds of hops. Grain was mashed at 150 ºF for 60 minutes, total volume was just under 5 gallons. Sparge was done with 165 F water, about 4 gallons, about 8 gallons was collected from the mash and sparge total. Wort was boiled for 65 minutes, mild boil over, nothing to report otherwise. 2 ounces dry-hopped – Pellets added to the carboy, left on for 10 days. All hops are pellets. Hops in the keg are in a hop bag inside a hop bag. they are weighed down so they sink to the bottom near the dip tube. 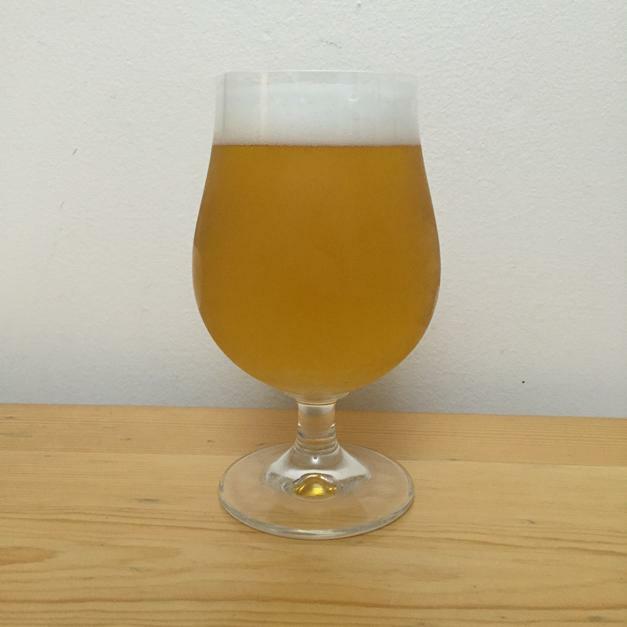 This beer received a portion of the dregs from the previous experimental hop saison ADHA 527. Fermentation took off within 12 hours and completed after about a week. It was left in the primary for an additional week for dry hopping and to make sure it finished up. This beer has been on draft at the house for the past month or so (been too busy to power through the beer) and it dropped completely clear at this point. I don’t make the clearest beer and I just don’t care if I do or not…seeing how clear this beer ended up sort of makes me want to make clear beer….maybe that’s something I should look into more. I did try a clarifier in a beer not too long ago, maybe I should put it on my list of things to try again. Beer is yellow and clear with a white head of small bubbles, decent retention, some lacing, moderate carbonation, not lasting carbonation though. Aroma is where this beer / hop has its strength. It is like orange peel, the sort of bitter / citrus flavor you get from biting into the orange. A little candy, pineapple, a little grassy, overall pretty citrus and sweet. Beer is light to medium in body and pretty bitter. Strong bitterness throughout, nice overall. The beer has this almost plastic flavor to it, good finish. The flavor is mostly citrus / pineapple in the midpalate, overall the fruit flavors are a little subdued in this hop but they are a nice presence. Overall, this hop isn’t an amarillo…or a citra…or a cascade. I get a little pepper and some fruit, the aroma is where it shines through the most. Not my favorite experimental hop thus far but a good one. It made a decent saison, I’m glad I made it. Overall, this beer is decent and a fine saison. I don’t think I’ll use Jarrylo hops as a showcase hop any time soon but they have a fine flavor, definitely citrus, but it shouldn’t be the focus of the beer. This hop would work well in concert with other hops. The body of the beer is really nice, I guess that’s the oats shining through, an under utilized grain which I’ve been taking more advantage of lately. I guess I’ll move onto a new hop now. I have to switch up my process of how I do these now because all the upcoming experimental hop beers are whole leaf hops. It’s a different ball game. But I do have those coming up this year so I think I’ll just tell you about them. I have a pound of Armadillo, Chocolate, Vinnie Special, J-Lime, Otto Supreme, Green Magic and Janis Hoplin (the worst hop name I can think of). I’ll build the equipment I need to get this done in August and then start back up with a renewed focus on these experimentals. Hopefully some good beers are accidentally produced by these actions. did a search for ‘nelson sauvin hops’ on google news (hoping to find some info on when the new crop will be available) and somehow found this article. very cool! Haha…yeah that’s my brewery up and coming. Any update on the other varietals you listed? Life has really gotten in the way but the others are coming. One is fermenting now. Sorry.